IT IS HARD TO PLEASE EVERYBODY BUT MORE THAN ONE THOUTHAND SIX HUNDRED GUESTS HAVE REVIEWED OUR HOSTEL AND THE 9.1 HIGH SCORE MEANS AMOST PERFECT !! See and experience the real core life of Beijing and stay in our Beijing traditional courtyard house within your budget. In the sense of home, Red lantern House is the closest while you are traveling. 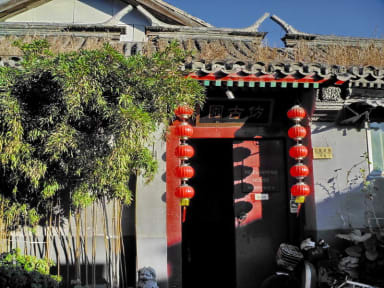 Behind the busy streets of Central Beijing, Red Lantern House is quietly located in the best part of the largest preserved Hutong area of downtown Beijing, which used to be the homes of royal and noble families. The main building was built in the eighteenth century in a traditional courtyard house attached to the famous Zhengjue Temple. This hostel aims to give its guests an opportunity to experience Chinese architecture and culture with local style by actually staying with a local family who provides guests with affordable private and shared rooms of many types and styles. To meet increasing demand of more and more international guests of different requirements, two more locations have been put into operation and the fourth is under renovation which will be fully ready for the 2008 Beijing Olympic Games. Red Lantern House now consists of the Main Building, West Yard, East Yard and Temple Court. They are all located in the same neighborhood and main street. More choices of different accommodation are available to suit your needs and tastes. No matter you are traveling on your own, as couples, whole family, as a group, the old or young, and even disabled (we have a handicap-accessible location), you will surely enjoy yourselves comfortably in a new home. This hostel actually is a restored heritage home but features all the comforts of a modern home with the ambiance and feeling of traditional Chinese decor. We have excellent facilities and our services are of more than a hostel standard. The uniqueness of our hostel is never easily found even you are staying in a five star hotel. This is why within a very short period it has become widely accepted as one of the best hostels and gained excellent reputation among guests from all over the world. The hostel is a family-owned facility offering all her guests a warm personal welcome and detailed services in a relaxed atmosphere of peace and tranquility where you won't feel isolated. Our staff is friendly and can speak English, always ready for help. All our lovely bedrooms are clean and of a fantastic value. To know more, check all seven pictures. The most popular Houhai Bar Street (Lotus Lane) is just a short stroll away with hundreds of bars and tea houses. You can rent a bicycle here which is the perfect way to explore the deep Hutongs to see another side of modern Beijing and China. Our neighborhood is safe and friendly. Just outside our hostel there are many local restaurants, stores, a post office, a huge super market called Wumart and banks including a local market in Hutong as well as Jishuitan Hospital nearby. Here you can get a taste of Chinese life. You will also enjoy the same prices as the locals for everything, as this area has no tourist prices. -trips to the Great Wall at all sections including the Great Wall at Mutianyu, Badaling, Simatai and Jinshanling. 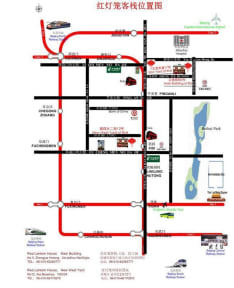 -tours and activities including the Beijing City Tour (Forbidden City & Tian'anmen Square, Summer Palace and Temple of Heaven), Hutong Tour, Beijing Opera, Chinese Acrobatics and Kungfu show. -ticket booking including train, flight (both international and domestic). In order to get to the hostel from the airport without hassle, we provide a very reliable airport pick-up service taking you all the way to the hostel without any problem. We are a Backpacker's hostel. Our place might not be suitable for everyone who is not used to having the backpacking experience. If you are hesitant about your choice, please make your specific requirements clear so that we could make a special one for you if possible. Leuk en gezellig hostel midden in een authentiek Chinees straatje. Very nice hostel, located in a nice cosy alley. Great ambiance in the hostel and the interior is really nice. They help you with arranging tours too the great big Wall of China and they have a small menu for breakfast and dinner. The only thing we missed was a kitchen to cook. And it’s very nice that they Speak english. Even zoeken en zeker de moeite waard. Doorlopen naar de tweede set rode lampionnen buiten. Mooie gemeenschappelijke ruimte, Chinees aangekleed met allemaal rode lampen en vijvers met karpers. Onze kamer op eerste verdieping. Heerlijk geslapen. Met airco! Douche en toilet apart, prima schoon, mooie blauwe wasbakken. Wij hebben genoten!! Great atmosphere, located close to supermarkets, restaurants en nice places to eat. Only 10 minute walk to subway. Rooms are nice and bathroom facilities very clean. Staff is very friendly and helpful. Great hostel in beautiful Hutong. Very good atmosphere and nice people who speak good english. Getting there by metro Ping Anli station (exit A) was easy. Nice hostel, easy to reach, nice staff! Great for a few days Beijing! We stayed in a private twin, which was basic but fine. The location in the hutong is perfect to get to know the ‘real’ china. The rooms surround the courtyard which may be noisy but staff makes sure everyone stays quiet after 10. The staff was very helpful, with booking tours and tickets. The red lantern house is een gezellig hostel. De kamers zijn goed in orde en omdat je maar met vier op een kamer slaapt, kan je zeker genieten van je nachtrust. De binnenplaats geeft mogelijkheden om andere gasten te leren kennen. Het enige minpunt is dat het personeel nogal koel overkomt, al lijkt dit overal in de grotere Chinese steden zo te zijn.